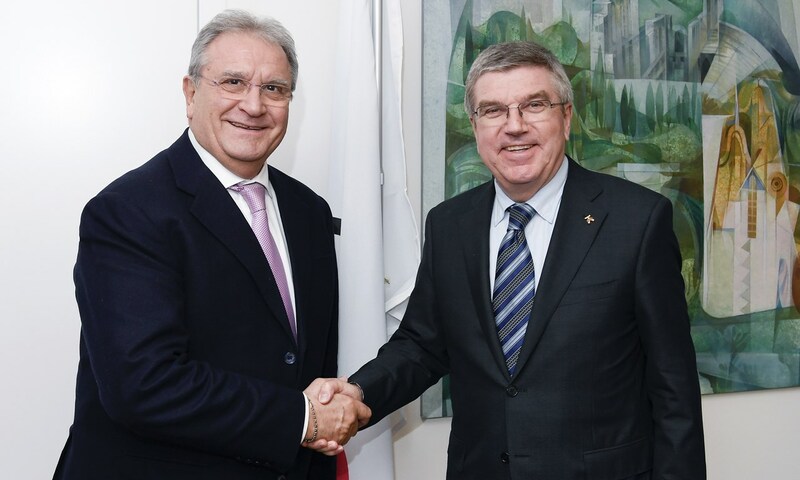 LAUSANNE, Switzerland — World Baseball Softball Confederation (WBSC) president Riccardo Fraccari met with International Olympic Committee (IOC) president Thomas Bach this week in the Olympic capital. WBSC Executive Director Michael Schmidt was also in attendance. President Fraccari briefed President Bach — an Olympic gold medallist in fencing at the 1976 Montreal Games — on the global development and international campaign of baseball and softball, which is being played in over 140 countries by an estimated 65 million male and female athletes. President Fraccari also shared baseball and softball’s steady progress and development projects in Africa, Europe, Oceania and the Middle East. The WBSC leader updated President Bach on baseball’s and softball’s unique youth world championships, which start from youth and advance to the highest levels (U-12 to pro). Baseball and softball are among the leaders in youth sport, and WBSC is the only international sports federation to stage official national team youth world championships starting with the 12-year-old age category, with the U-12 Baseball World Cup and U-15 Baseball World Cup. President Fraccari also informed the Olympic leader that the capital of African nation Botswana will host the II WBSC Congress 2017. Discussions also centered around President Bach’s Olympic Agenda 2020 vision and the WBSC president re-confirmed that baseball and softball will do everything possible 1) to help realise the innovative vision to keep the Games sustainable, while engaging the next generation of young fans/athletes and spreading Olympism worldwide and 2) to earn a place in the Olympic Games over the long-term, which includes showcasing the best-ever international baseball and softball events in history at Tokyo 2020. On Monday, 5 December, President Fraccari will meet with IOC Sport Department Director Kit McConnell to review plans for the Olympic Games Tokyo 2020.